“Abraham has once again gone beyond the leading edge of thought,” building on the most powerful processes described in the previous book Ask and It Is Given, and showing very clearly “how to move up the Emotional Scale. This new book provides the answers that people receive when they bring their practical, real-life questions to an Art of Allowing seminar. These are Abraham’s “recipes for success,” gathered together for the first time in The Amazing Power of Deliberate Intent. 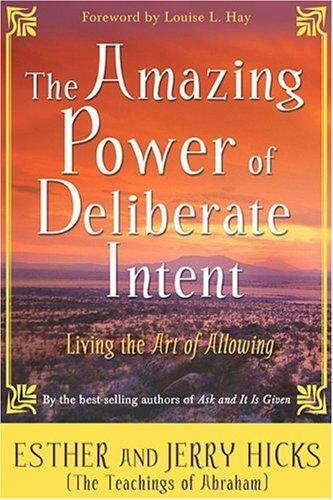 This already popular book by Esther and Jerry Hicks, who present the teachings of the non-physical entity Abraham, is about having a deliberate intent for whatever you want in life, while at the same time balancing your energy and living the Art of Allowing along the way. But it’s important to note that the awareness of the need to balance your energy is much more significant than goal-setting or focusing on ultimate desires. And it is from this very important distinction that this work has come forth. As you come to understand and effectively practice the processes offered here, you will not only achieve your goals and desired outcomes more rapidly, but you’ll enjoy every single step along the path even before their manifestation. As such, you’ll find that the living of your life is an ongoing journey of joy, rather than a series of long dry spells between occasional moments of temporary satisfaction. This leading-edge book by Esther and Jerry Hicks, who present the teachings of the nonphysical entity Abraham, is about having a deliberate intent for whatever you want in life, while at the same time balancing your energy along the way. But itâ€™s important to note that the awareness of the need to balance your energy is much more significant than goal-setting or focusing on ultimate desires. And it is from this very important distinction that this work has come forth. As you come to understand and effectively practice the processes offered here, you will not only achieve your goals and desired outcomes more rapidly, but youâ€™ll enjoy every single step along the path even before their manifestation. As such, youâ€™ll find that the living of your life is an ongoing journey of joy, rather than a series of long dry spells between occasional moments of temporary satisfaction.